1 What Exactly Is Glutamine? 2 How Does Supplementing With It Help The Bodybuilder? 4 Glutamine is a good anti-catabolic supplement, but shouldn’t I be looking for an anabolic supplement? Glutamine is one amino acid that has been getting its fair share of attention. This attention doesn’t just come from weight lifters; it comes from virtually everyone interested in good health. Looking at what the research has shown regarding its effects, the positive attention is not at all undeserved. This is a bodybuilding supplement that can help maintain muscle mass and possibly contribute to new muscle growth. It is also a general health supplement that can help strengthen the immune system. It is often used to help trauma patients recuperate. In the same way it helps trauma patients, glutamine can help enhance the immune systems of those on demanding workout schedules, helping them stay healthy. Glutamine is a non-essential amino acid meaning that the body can manufacture it. While it is possible to ingest it directly from food sources (meats, milk protein, etc. ), the body primarily relies on ingesting glutamic acid (glutamate) and converting it to glutamine. This conversion occurs in the liver where glutamate combines with ammonia to form glutamine. The conversion can go the other way, glutamine converted back into glutamate and ammonia. This process, the conversion back and forth, is ongoing and a fundamental way the body regulates its acid-base balance. A healthy diet will supply the body with the ability to produce somewhere between 3.5 and 8 grams a day. It becomes the most abundant amino acid in blood and muscle tissue. It is present at some level in all organs of the body and aids in their function, being especially important for the overall immune system and gastrointestinal tract functioning. Medically, glutamine supplements are prescribed to aid in healing and increase immunity for patients with GI disorders, burns and other wounds, certain types of cancers and many other ailments. How Does Supplementing With It Help The Bodybuilder? Glutamine’s rise in popularity with weight lifters can be traced to comparisons between the trauma associated with hospitalized patients and the trauma produced by intense exercise. Both situations have proven to severely hamper the immune system. A major reason for this is the body’s inability to produce enough glutamine to compensate for the extreme stress. It operates as fuel for immune cells making it vitally important for immune system functionality. Hospitals have proven positive results from supplementing trauma patients, typically with about 20 to 40 grams a day. This should be enough reason to create excitement in weight lifters who have long suffered from an increased occurrence of infections. But, alas, weight-lifters’ ears tend not to perk up until you mention a supplement’s ability to make their muscles bigger. Fortunately, it comes through here as well. In the same way glutamine provides fuel for immune cells, it supplies fuel for muscle cells. Intense exercise can very quickly deplete the supply of glutamine in muscle cells by up to 40 percent. As the body seeks sources of energy, it is sacrificed to convert to glutamate which ultimately breaks down to form the energy molecule, ATP. With about 60 percent of free amino acids in muscle tissue being glutamine, it is easy to see where this can be a hindrance to those of us seeking to add muscle (and, necessarily, not lose the muscle we have) because the lack of sufficient glutamine is helping to create a catabolic state (where muscle tissue is broken down to aid in energy production – also known as a negative nitrogen balance). Supplementing has been shown to slow down or stop this catabolic state. In the case of over training syndrome (OTS), where the body enters a prolonged negative nitrogen balance state, low levels of blood glutamine are present. Without direct supplementation, recovery from OTS to normal glutamine levels can be extended, sometimes requiring six weeks of complete rest or more. Supplementation is very valuable for preventing OTS and allowing you to work harder and make the muscle gains you are after. More on overtraining. But the potential benefits do not stop with its anti-catabolic abilities. It plays a vital role in protein synthesis (the building of new muscle). Additionally, through ways not yet fully known, it has been shown to aid in replenishing muscle glycogen stores which increases muscle volume (makes bigger muscles). Glutamine has also been shown to have the ability to raise growth hormone (GH) levels. GH can be responsible for elevated moods as well as possibly encouraging muscle growth. When you add together the ability to boost the immune system, help prevent catabolism and create volume within the muscles, and the many other benefits of giving the body an ample supply of glutamine, you come up with one of the most valuable of the bodybuilding supplements. Glutamine comes in a tasteless powder form that easily dissolves in liquid. It also is available in tablets but the powder form is a far better value and can be added to your meal replacements or whey protein powders without you ever knowing it’s there. Recommendations for amounts to take can vary and most likely you’ll have to do some experimenting to find the levels that seem to be the most beneficial to you. Weight lifters seeking mass gain typically use between 5 and 20 grams daily per 100 lbs. of bodyweight. Daily amounts are typically split into three, one first thing in the morning, one mid-day and another just before bed-time though some split it to upwards of six individual dosages. On workout days, the mid-day dosage is put immediately following the workout or an additional dosage is added so that a dosage can be taken with the pre-workout meal and another with the post-workout. The critical times for providing the body with a glutamine supplement are immediately after a workout and just before bed-time. Supplementing immediately after a workout can help with recovery and glycogen replenishment. GH release is naturally at its height during sleep and adding glutamine just before is believed to encourage this process further. Budgetary concerns can crop up. 10 grams a day will cost about 50 cents a day and a 20 gram a day schedule will cost close to a dollar a day. Beware of the meal replacements and other products which advertise the side benefit of glutamine. Sometimes these products include such a trace amount that it will not make a difference. It will usually be more cost efficient to add it yourself. Glutamine is a good anti-catabolic supplement, but shouldn’t I be looking for an anabolic supplement? If your goal is a net gain in muscle mass, lessening catabolism is just as important as increasing anabolism. The less muscle tissue you lose, the less you have to gain to get that net increase. 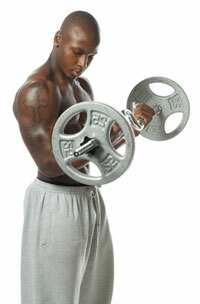 Searching for effective “anabolic” supplements can prove a frustrating task. While you will find virtually every bodybuilding supplement claiming to increase your anabolic capabilities, the extent to which they deliver on this promise is questionable. Only creatine really stands out as a proven muscle builder and that is based more on its ability to help you work more intensely. To keep your body in an anabolic mode, you must simply EAT. Check here for information on putting together a solid weight gain diet.